Kew Town includes the area between Downtown and Blue Hills. Centrally located on Providenciales between the Downtown and Blue Hills districts, Kew Town is primarily a residential area with some small shops, restaurants and businesses. It's a short distance from the Providenciales International Airport (PLS). No hotels or villas are located within this area. 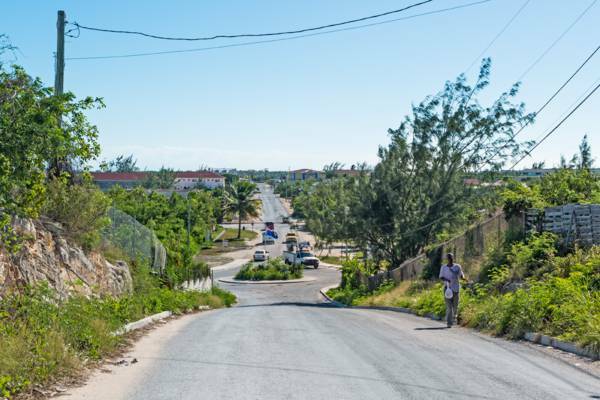 Historically, Providenciales was split into two islands, with a channel running through main Blue Hills access road. Due to this fact, Kew Town is prone to extensive flooding during heavy rains and hurricanes. Kew Town's name has town appended to distinguish it from the farming village of Kew on North Caicos. Providenciales did not see the extensive cotton plantations that were built on North Caicos and Middle Caicos, however it did support a few Loyalist planting attempts. Cheshire Hall is the best known of the plantations on Providenciales, and actually is located nearby in the Downtown area. The site of Kew Town itself also had a plantation, Tucker’s Hill, the ruins and field walls of which still stand on the hills above the current settlement. The Kew Town region also supports one of the few farming attempts on the island where crops are raised in the natural soil (as opposed to other hydroponic and aquaponic arrangements elsewhere on the island). This farm produces bananas, plantains, tomatoes and papayas. Last reviewed by an editor on 8 February 2017.